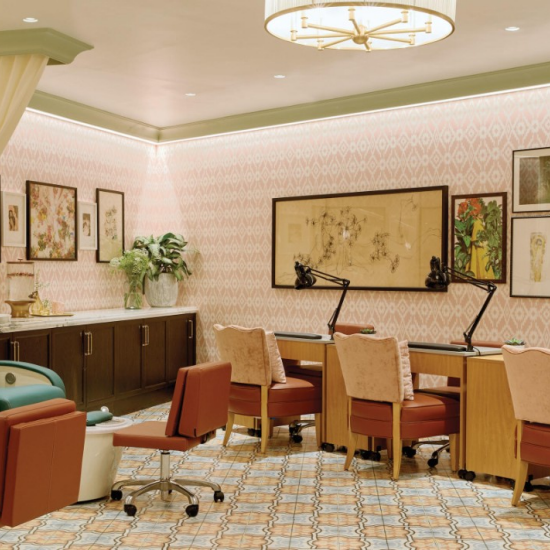 The Salon at Park MGM will handle the rest. We've got the rosé on ice, so you can sip back and relax during your favorite nail or hair service. Let us know when you want to drop by. Hotel guests can use the jacuzzi, sauna, and steam room for a service charge of $20. This fee is waived when a guest books a spa service. All Hair services served with first glass of Rosé complimentary. Kopari brown sugar and Tahitian coconut shells buff away dry skin, followed by a Coconut Milk massage and Coconut Balm mask with warm towels, nail care and polish. Kopari brown sugar and Tahitian coconut shells buff away dry skin, followed by a Coconut Milk massage and Coconut Balm mask with warm towels and nail care and polish. This luxury manicure and pedicure comes with some sweet coconut extras. The extended service begins with a Kopari Organic Coconut Oil bath to soften hands and feet followed by a brown sugar and Tahitian coconut shell exfoliation. A relaxing Kopari Coconut Milk massage relieves stress and tension. Cuticles are cleaned up, nails are shaped and a fresh coat of polish will have you feeling like pure paradise. End your Salon day with a luxury hair shampoo and blow out by one of our talented Stylist. Walk into the resort and straight through the lobby. Head straight into the convention spaces. Take the escalator up to the second floor. Veer left into the entry marked Madison Meeting Center. Upon walk to the right towards the Fitness Center. The Salon will be on the right hand side of the hallway. Enter the resort from Las Vegas Boulevard and head left into the casino towards the convention spaces. Once at the glass doors walk into the convention area. Take the escalator up to the second floor. Veer left into the entry marked Madison Meeting Center. Upon entering walk to the right towards the Fitness Center. The Salon will be on the right hand side of the hallway. Upon exiting Park Theater make a left into the casino towards the convention space. Once at the glass doors walk into the convention area. Take the escalator up to the second floor. Veer left into the entry marked Madison Meeting Center. Upon entering walk to the right towards the Fitness Center. The Salon will be on the right hand side of the hallway.